The Military Sealift Command's USNS SAFEGUARD provided ship time for servicing the NOAA KEO mooring. Typhoon Pabuk passes the KEO mooring. Image courtesy of JTWC/SATOPS. OCS Technician Patrick Berk services the KEO mooring. Photo credit: Nathan Anderson, OCS. The OCS Kuroshio Extension Observatory (KEO) surface mooring is located south of the Kuroshio Extension current, at 32.3°N, 144.6°E. The Kuroshio Extension current carries warm water at nearly 140 million cubic meters per second eastward into the North Pacific, and is a region where the ocean generally loses heat to the atmosphere. The Kuroshio Extension is fed by the Kuroshio Current that carries warm tropical water northward, helping the global ocean system maintain a heat balance between the equatorial regions of heat gain, and polar regions of heat loss. Net heat flux out of the ocean into the atmosphere, colored in units of Watts/m2. 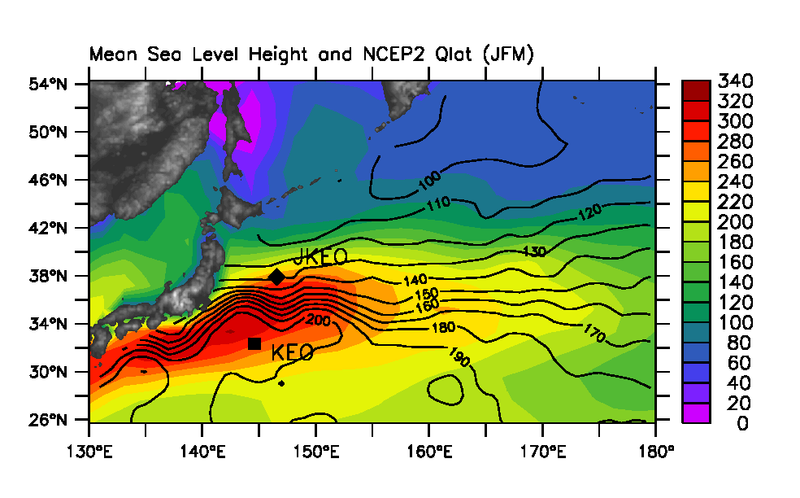 Contour lines show sea level height, which indicates the location of the Kuroshio Extension Current. Click to enlarge. During winter, cold dry air blowing off the Asian continent moves over the warm waters of the Kuroshio Extension current. This causes very large heat loss from the ocean, and warming of the atmosphere. The exchange of heat and moisture into the atmosphere is an important factor in the development of storms over the north Pacific before they reach the United States. During the summer and fall months, typhoons are common in the western North Pacific. On average, a typhoon passes within 500NM of KEO every two weeks during the peak of the tropical cyclone season. The KEO mooring is well positioned to observe the transition of tropical cyclones to extra-tropical storms, and to measure the exchanges of heat and moisture between the atmosphere and ocean associated with these storms. The OCS KEO mooring was first deployed in June 2004, as an element of the Kuroshio Extension Systems Study (KESS). 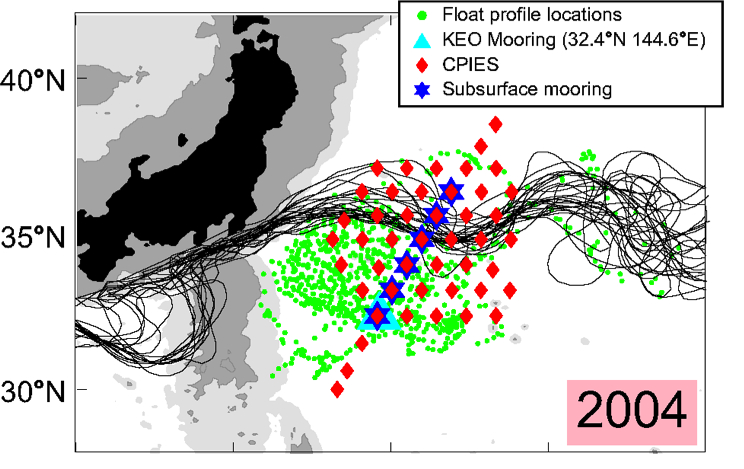 KESS was a two-year process study, funded by the National Science Foundation (NSF), to investigate interactions between the Kuroshio Extension and its recirculation gyre. At the conclusion of KESS in February 2007, a NOAA partnership with the Japan Agency for Marine-Earth Science and Technology (JAMSTEC)'s Institute of Observational Research for Global Change (IORGC) was formed. In addition to contributing shared time on their research vessels to perform KEO mooring maintenance operations, JAMSTEC deployed other moorings in the area, including JKEO, NKEO, and S1. These moorings supplied data for several research initiatives, including Hot-Spot: Japanese Air-Sea Interaction Experiment, begun in 2011. In 2013, two years of NOAA funding was awarded to make the KEO mooring into a "Storm Mooring," in a project to increase data transmissions and use the real-time KEO data to improve short-term and seasonal hurricane predictions. A JAMSTEC Sediment Trap mooring was first deployed near the OCS KEO mooring in 2014. 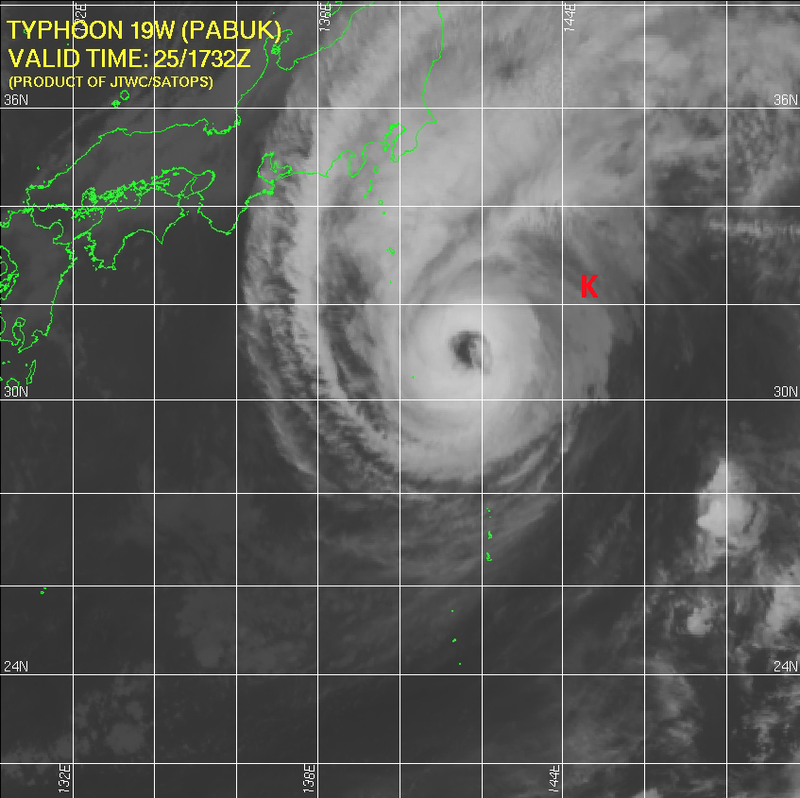 Typhoon Pabuk passes the KEO mooring.